Rudy Rufer, who played 22 games for the New York Giants from 1949-1950 died October 25, 2010. He was just three days shy of his 84th birthday. Rufer grew up in Ridgewood, Queens and attended Aviation High School. He attended Dartmouth College, the University of Oklahoma and served in the Navy. 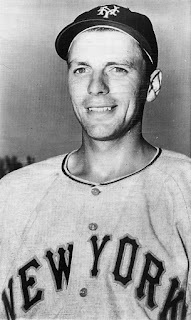 Rufer was signed by the Philadelphia Phillies in 1948 and was quickly drafted by the Giants the next season. After hitting .266 at Jersey City in AAA, Rufer made his major league debut on September 22, 1949 in only his second year in professional ball. He would receive another cup of coffee in 1950, compiling two hits in 26 at-bats. He would play minor league ball until 1957, serving as a minor league manager from 1956-58 with the Class D Thomasville Dodgers. Rufer transitioned into the role of a scout for the Dodgers organization, working in that capacity for 25 years. Unfortunately, in his waning years while recovering from cancer surgery, Rufer was robbed by one of his nurse's aides, stealing most of his baseball memorabilia including his World Series ring. Luckily the material was quickly recovered by police. Rufer's passing leaves only 38 living players who played for the New York Giants before they moved to San Francisco in 1958. My grandfather played briefly with the St. Louis Browns in the late 30's and alot of those ball players have left us for the great ball game in the sky as well. Who was your grandfather? There are only a scant few left who made their debuts in MLB in the 1930's that are still alive. Bob Feller, Bobby Doerr, Phil Cavaretta and Al Brancato come to mind.